Left Coast Rebel: Ron Paul - Current Conditions or a Bad Dream? Ron Paul - Current Conditions or a Bad Dream? "Some people will go through their whole lives in a dream, hoping that a Free Lunch is not just free, but a precursor to a lunch that you are paid to eat. As for me? 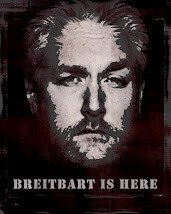 For the people who read this blog, who support Ron Paul and who carry their worn Constitutions in their back pockets? They are awake and even if they are not on ABC or NBC, even if they are not out there everyday intoning the magic words of “hope.” The spiritually cleansing words of “change.” They are out there, your blog shows as much and I am proud that we are providing more then “hope” and more then “change,” we’re providing a choice not an echo." And to that I would say that Goldwater would be proud as I am proud, for I know that there is much hope for the fight for liberty in America with young people of such intellect and strength of mind as Young American. I fear that the election of Obama marked the point of no return. I too hope I am wrong. I, too, fear it may be too late. I also hope I'm wrong, but I just did a post this evening that could be a sign of things to come. It's titled "The New Ruby Ridge". We, as a nation, go in waves. Obama will push us too hard to the left and a leader will emerge who will take us back into fiscal responsibility. Of this I am certain. Just not as to when. Or who. We need a leader who can articulate the ideals which so many still hold dear. The ideals of our founding fathers and of the generations which have made this nation great. Someone to remind us all who we are and why we should be proud. That leader will come. And I pray to God that leader comes soon. I agree with you, Tommi. I've lived through and remember the Ford through present administrations, and yes, we do go in waves. The only difference I see is that this administration is so much worse and has done so much unprecedented damage that I'm truly afraid for the country my kids are going to be left with. I'm with you: we need our version of The One. LCR; been following you for awhile(around #100), enjoy it greatly. Proud to have you on board w/ mine. The revolution, and NOTHING short of, will begin in the states at the local levels then grow. The ultimate goal, to me, is the death of the Fed Res. Only by its death, the will of 'We the people' be heard and obeyed. Every item of question today can be traced to the leviathon --The Federal Reserve. I always push this book,THE CREATURE FROM JEKYLL ISLAND - A Second Look at the Federal Reserve by G Edward Griffin.It woke me up, red pill-blue pill is BS, it's the green pill. Carry on,as said enjoy your blog, Sharky. I hope we can get out of this mess. But it loks like we may not. Some people will go through their whole lives in a dream, hoping that a Free Lunch is not just free, but a precursor to a lunch that you are paid to eat. As for me? For the people who read this blog, who support Ron Paul and who carry their worn Constitutions in their back pockets? They are awake and even if they are not on ABC or NBC, even if they are not out there everyday intoning the magic words of “hope.” The spiritually cleansing words of “change.” They are out there, your blog shows as much and I am proud that we are providing more then “hope” and more then “change,” we’re providing a choice not an echo. Wow! This man was rejected by Republican voters for lapdog McCain who say BO is doing a "good job"? No only has McCain gone senile, seems Republican voters as well. 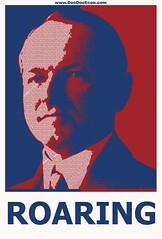 This man should be on the ticket for 2012, not the circus that's Palin. That short speech is one of the best I've heard since Reagan. 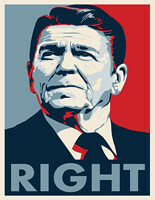 I think Reagan would be proud of Paul and so disappointed in voters today. I can see why BO sees anyone supporting this man as a potential terrorist. It must terrorize him and liberals like him of the thought of such a clear minded, rational, and responsible man could ever be President. A man that truly defines a choice instead of the clones and echos of the last 20 years. RightK - Like I have said before, not without a fight and over my dead body! Landshark - I appreciate your readership and I must say that your content at your blog is getting better by the minute, I'm putting you on the blogroll! Fuzzy - Mark my words, we will stop this! Young American - We are awake here! I appreciate you support and brilliant words here, once again, I'm going to put your comment in the post....Goldwater would be proud! I had a call from the Tennessee Young Republicans today, Charles Smith. After hearing the recorded message, I thought "that is everything I believe it." Then my next thought was, "will we have to wait for college students who are Young Republican Conservatives, to run for public office before we will truly have some new Conservatives to vote for?" that might be a long time. Obama may be the breaking point for many who are now searching for an alternative, and Conservatism may be that alternative. Debbie - I hope and pray for the same.